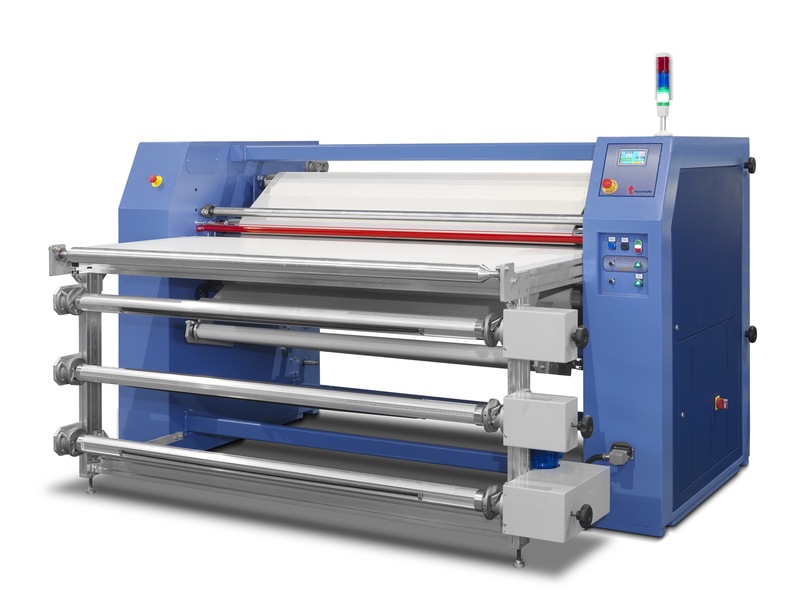 The Transmatic 7460/7472 SPORTS has been specially designed for digital printing on cutted pieces and placed prints. This application is indicated especially in the field of printing of sport shirts. A new system of heating oil ensures a uniform temperature distribution over the entire length of the cylinder with a minimum consumption of energy. The heating systems oil Transmatic consume 50% less energy of electric machines. The diameter of the drum 35 cm/ 13.8 ” is suitable to the needs of digital printing. The sheets of transfer paper are placed with the design facing upward on the table, the cut fabrics (front, rear, arms, necks etc.) Are placed above the drawing. The pieces of printed fabric and the paper out both on the front of the machine. Use of transfer paper in reels with the possibility of placing pieces of fabric cut. Mainstream press, transfer paper and tissues of both continuous. The calenders transmission with the new oil actually increase your production, make risparmare time and energy costs. High productivity, design quality and our service after the sale, give good reasons to invest Transmatic, for all the needs of digital sublimation printing, offset and gravure. Net weight 1450 kg / 3196 lb. 1900 kg / 4188 lb.